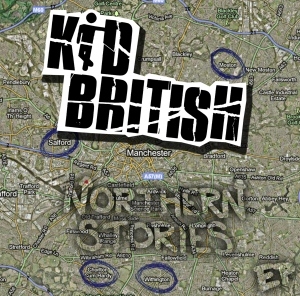 You wouldn’t be blamed for expecting an EP with the title ‘Northern Stories’ to be your standard working-class affair; the North/South rift, class wars and council houses, but you’d be forgetting that KiD BRiTiSH aren’t The Enemy or Twisted Wheel. Their new offerings are about as Mancunian as they come, but don’t be fooled, while they’re not going to challenge any existing Northern stereotypes, it’s a heart-warmingly poignant snap shot of life, with music as diverse as the band themselves; a self-declared “multiracial, multi ethnic reflection of modern Blighty”. Lyrically, the EP features the unique brand of self-depreciating sardonism and that couldn’t quite exist anywhere else, and provokes more than a few knowing smiles of agreement and nods of approval. ‘Bookies’ kicks off the four track EP in raucous fashion. It’s a punk rock riot with a thundering riff and a perfect example how 21st Century Indie Rock can unite with 70’s 2 Tone Ska and sill sound modern and exciting. It avoids all the usual clichés of a song about escaping a humdrum city and will leave you feeling suitably exhilarated and optimistic. On the surface, ‘Northern Quarter’ is the paradoxical story of hipsters, and how everyone is guilty of being one, apart from the narrator of the story, with an undeniably catchy King Blues style chorus. But scratch a little deeper and the cynical lyrics (“looking the part won’t pay the mortgage”) and undertone of drugs, crushed dreams and imitating heroes (“they call him weekend Weller/what a very sad feller”) prove ‘Northern Quarter’ is a little more frank than the average anti-poser protest. ‘Piccadilly Gardens’ is a short but sweet acoustic song declaring the joys of public transport and coming home. A foot-tappingly lovely tune that you’ll be humming all day, which provides some light relief from the harsh realities of the rest of the EP, and proves that musically KiD BRiTiSH have refined their sound since the early days of Reggae and Hip-Hop infused ‘Elizabeth’ and ‘Our House is Dadless’ and are capable of a more subtle sound. In the final track, the Ska influences are as audible as ever, and combine with the darkest subject matter of the EP. In the same way that Arctic Monkeys’ ‘When The Sun Goes Down’ is a thought-provoking kitchen sink view into dystopia, ‘Tib Street’ opens with a vox pop of a woman of the night explaining her downfall into her current situation, and her means of survival, because an album about Manchester just wouldn’t be believable without some selected doom and/or gloom. Despite the harrowing topic, ‘Tib Street’ won’t have you locked it your bathroom with the lights off on the phone to Samaritans; it’s an emotive slow-burner that could easily have a crowd chanting along, and grow to become the highlight of the EP. Between all the name-dropping and dead-on social and political observations, that are more relevant than ever, Northern Stories is quite frankly very good. If this is a taster of the album to come, then be excited, even if they decide not to broaden their horizons to the rest of Britain, because nothing beats the feeling of camaraderie at sharing an in-joke.